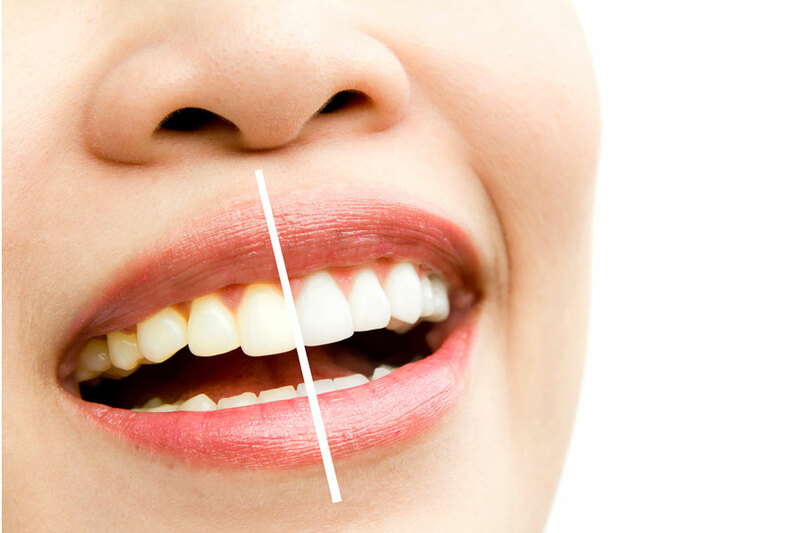 If your teeth are stained or discolored due to lifestyle factors, development problems, age or other reasons teeth whitening may be the perfect solution. You have the choice between home bleaching and in surgery bleaching. The results varies from patient to patient depending on the condition and underlying shade of the teeth. However, they can offer a very aesthetic result with minimum side effects. A proper assessment by the dentist is important. A: Tooth whitening is a process where the natural color of the tooth is lightened by the use of an oxidizing or bleaching agent. The bleaching agent is either hydrogen peroxide or carbamide peroxide. Q: How does whitening work? A: The bleaching agent penetrates the porosities in the rod like structure of the tooth enamel and oxidizes the stain deposits between the prisms. With time, the bleach progresses to the dentine layer under the enamel and bleaches this in the same way. Dentine is dark in color and is continually deposited during the life of the tooth, which is why teeth get darker with age. It is therefore essential that the bleaching agent penetrates to the dentine to obtain maximum lightening effect and this is why many dentists prefer the slower home bleaching and also why it gives a more stable result. A: There are two methods of bleaching – home bleaching and in surgery bleaching. The effect of the bleaching product is accelerated with an energy source. The soft tissues around the teeth are protected by the application of a rubber coating and the bleaching gel is then applied directly to the teeth. A light activation system is then used to accelerate the whitening process for approx. 10 minutes after which the bleaching gel is removed and the process repeated until the desired shade is achieved. A combination of the two procedures is often recommended to achieve a more pronounced, longer lasting effect. Bleaching with a home kit prior to in surgery bleaching allows more penetration of the bleaching gel and therefore deeper bleaching and brighter color. Bleaching with a home kit after in surgery bleaching helps to stabilize the color change achieved. It should be noted that penetration of the dentine by the bleaching gel is necessary to effect a stable color change and as the dentine tubules are in communication with the pulp chamber of the tooth which contains nerve tissue, there will always be some sensitivity experienced. For people with sensitive teeth most dentists recommend the gentler home bleaching technique. A: Treatment results may vary depending on the original shade of the teeth. Teeth will tend to darken slightly over time but the bleaching can be repeated. The effect lasts for around 1 to 3 years, although sometimes it can last longer but the whiter shades are not stable and require constant refreshing. As mentioned above, some people find that their teeth are sensitive for the first few days after treatment but this wears off after just a short while. A: Whitening can only lighten your existing tooth color- for a change to a specific chosen shade veneering is another option. Whitening also only works on natural teeth. It will not work on any type of false teeth. This includes dentures, crowns and veneers. If you have crowns, veneers or tooth colored fillings present these may need replacing following bleaching to achieve an aesthetic color match to your newly whitened teeth. A period of two weeks without bleaching should be left before any color matching for crowns or veneers takes place. Some teeth that have received trauma in the form of a bang become “internalized” and appear darker than the rest of the dentition. This color change is due to over-development of the dentine as a reaction to the trauma and eventually the root canal system is obliterated. It is not possible to bleach these teeth by any means and in this situation a veneer is necessary. Different colors react differently to bleaching. Yellow shades respond better than grey shades. Contact us for more information on teeth whitening or to schedule a FREE consultation session in Vancouver.